Shelf Bins – nesting by Metro Shelving organize your product on and of wire shelving. Because they nest, they are less expensive to ship. So they provide more value for your dollar. 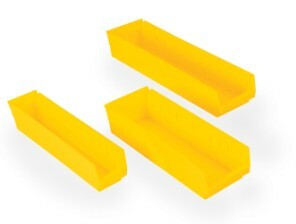 Furthermore, Clear Supply Bin Solutions offer a convenient way to organize and identify small items. Because they are available in a variety of sizes, shelf bins can be used to compartmentalize exchange carts or to store small patient care items. Shelf bins are designed to nest, to reduce box size for shipping. When used in a two bin process, the empty bins can be nested to occupy less space in the replenishment area. Shelf Bins - nesting by Metro Shelving organize your product on and of wire shelving. Because they nest, they are less expensive to ship. So they provide more value for your dollar.